Herschel has found the first robust evidence of molecular oxygen in the Orion Nebula. The observed abundance is ten times larger than indicated by previous observations of other molecular clouds, but is still well below theoretical expectations. The results suggest that, in special circumstances, the heat from newborn stars can liberate oxygen frozen out on dust grains, thus increasing the amount of molecular oxygen able to form in warm, dense gas clouds. 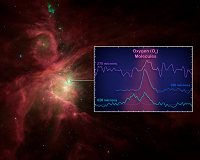 Herschel detects molecular oxygen in the Orion Nebula. The dense molecular clouds where stars form are characterised by an extremely rich chemical composition. With the aid of spectroscopy, astronomers sample these cosmic reservoirs of atoms and molecules and try to obtain an inventory of the spectral lines from the chemical species contained therein. This inventory is a key input for understanding in detail the processes that give birth to stars and planets. Oxygen, the third most abundant element in the Universe after hydrogen and helium, is a crucial component in the chemistry of molecular clouds, as well as a fundamental element for life on Earth. For this reason, great efforts are dedicated to the quest for oxygen in space. Scrutinising interstellar clouds and comparing the findings with laboratory and theoretical chemistry, astronomers search for signatures of this element in space. In particular, they strive to uncover where all the oxygen they expect to observe is 'hidden' and to determine the relative abundances of its different forms – whether as atoms or molecules, in gaseous form or solidified on the surface of cosmic dust grains. "Theory suggests we should find lots of oxygen atoms locked in molecular oxygen (O2), but previous searches kept falling short of such a large amount," comments Paul Goldsmith from the Jet Propulsion Laboratory in the US. Goldsmith is the NASA Herschel Project Scientist and first author of a paper reporting on the detection, with Herschel, of significant amounts of molecular oxygen in the Orion Nebula. "With these new data, we finally have a strong hint at where cosmic oxygen might be hiding," he adds. The hunt for interstellar O2 is proving to be particularly challenging. To track down the presence of a molecule in cosmic sources, astronomers examine the spectra, seeking lines at specific wavelengths. These lines correspond to energy released by the molecule as it undergoes changes in its rotation. Molecular oxygen can be considered to be a tiny dumbbell, which can rotate end-over-end at different rates. As with many other molecules, O2 produces a number of lines at a distinct set of wavelengths. Unfortunately, the large amount of molecular oxygen in Earth's atmosphere makes it almost impossible to detect cosmic signals from this species with ground-based observations, as atmospheric O2 absorbs virtually all radiation at the wavelengths of interest. Thus, this elusive molecule must be sought using space-borne instruments. The chemical reactions leading to the formation of O2 in dense clouds are very well understood, and predict that a molecule of oxygen should be found for every 100 000 molecules of hydrogen (H2). However, the two missions that performed this search during the past decade – NASA's Submillimeter Wave Astronomy Satellite (SWAS) and the Swedish-led Odin spacecraft – sampled a variety of clouds and recorded a substantially lower concentration of O2, about 100 times less than expected. "Determining the actual abundance of O2 in molecular clouds is crucial to understanding how strongly this molecule contributes, relative to other species, to the cooling of interstellar material," explains co-author René Liseau from Chalmers University in Gothenburg, Sweden. Cooling of molecular clouds is one of the fundamental steps leading to the formation of stars. The discrepancy between observed and expected abundances can be explained if some of the oxygen atoms freeze out on the surface of dust grains in the colder parts of the clouds. There, they would react and form other species, including water ice. This would mean that a substantial fraction of elemental oxygen is locked in molecules of water in the solid state. However, Herschel's new data indicate that, in certain regions of molecular clouds, the effect of this 'freeze out' might be less dramatic than previously thought. The Herschel Oxygen Project, an open-time key programme of which Goldsmith is Principal Investigator, has been specially designed to shed light on this much-debated issue. "We have observed some regions of the Orion Nebula with the HIFI spectrometer and detected the signal of O2 molecules at three distinct wavelengths," notes Goldsmith. "The abundance of this molecule is still below theoretical predictions, but we see evidence, for the first time, that it might be greater, in some spots of the cloud, than the average value," he adds. According to the new spectra, the region probed within this study contains one O2 molecule for every million molecules of H2 – only ten times less than predicted by theory. "These measurements find an explanation in the interplay between oxygen freezing out on dust grains and a counteracting effect due to neighbouring newborn stars," explains Liseau. "Their heat, warming the grains, would cause water ice to evaporate and re-establish chemical reactions that result in the formation of O2," he adds. The study was possible thanks to the high sensitivity of the instruments on board Herschel, to the telescope's high spatial resolution and to its wide spectral coverage. These characteristics allowed the astronomers to track down the unambiguous signature of molecular oxygen by observing it in three different lines in the regions they studied, across the far-infrared portion of the electromagnetic spectrum, and to pinpoint the position of the O2 reservoirs very precisely. "The discovery of at least part of the 'missing' interstellar oxygen is a remarkable result achieved by Herschel," comments Göran Pilbratt, ESA Herschel Project Scientist. "More observations of other molecular clouds are planned, and we are eagerly awaiting the results of this on-going search for one of the most elusive molecules in space," he concludes. The study presented here is based on observations of the 'H2 peak 1 position' in the Orion Nebula, performed with the HIFI spectrometer on board Herschel within the Key Programme Herschel Oxygen Project (HOP). The astronomers have detected three distinct emission lines corresponding to rotational transitions of the oxygen molecule, at frequencies of 1121, 774 and 487 GHz, respectively. The analysis of the spectroscopic data relies on catalogues made available through the Jet Propulsion Laboratory Molecular Spectroscopy Data Base, the Cologne Database for Molecular Spectroscopy, and the Leiden Atomic and Molecular Database. HIFI, or the Heterodyne Instrument for the Far Infrared, has been designed and built by a consortium of institutes and university departments from across Europe, Canada, and the United States under the leadership of SRON Netherlands Institute for Space Research, Groningen, The Netherlands, and with major contributions from Germany, France, and the US. Consortium members are: Canada: CSA, U.Waterloo; France: CESR, LAB, LERMA, IRAM; Germany: KOSMA, MPIfR, MPS; Ireland: NUI Maynooth; Italy: ASI, IFSI-INAF, Osservatorio Astrofisico di Arcetri-INAF; Netherlands: SRON, TUD; Poland: CAMK, CBK; Spain: Observatorio Astronómico Nacional (IGN), Centro de Astrobiología (CSIC-INTA); Sweden: Chalmers University of Technology - MC2, RSS & GARD, Onsala Space Observatory, Swedish National Space Board, Stockholm University - Stockholm Observatory; Switzerland: ETH Zurich, FHNW; USA: Caltech, JPL, NHSC. P. Goldsmith, R. Liseau, et al., "Herschel measurements of molecular oxygen in Orion", Astrophysical Journal, in press.